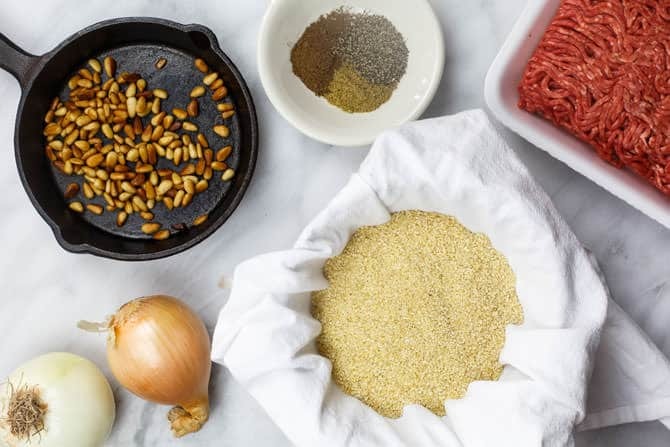 In this kibbeh recipe, a mixture of bulgur wheat, onions, and ground beef forms a hollow shell for a delicious stuffing. 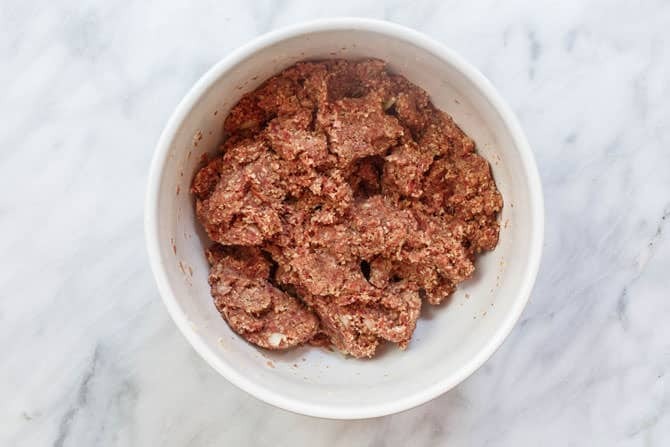 Enveloped in warm and earthy Middle Eastern spices like allspice and ground cinnamon, kibbeh is the epitome of Middle Eastern comfort food. 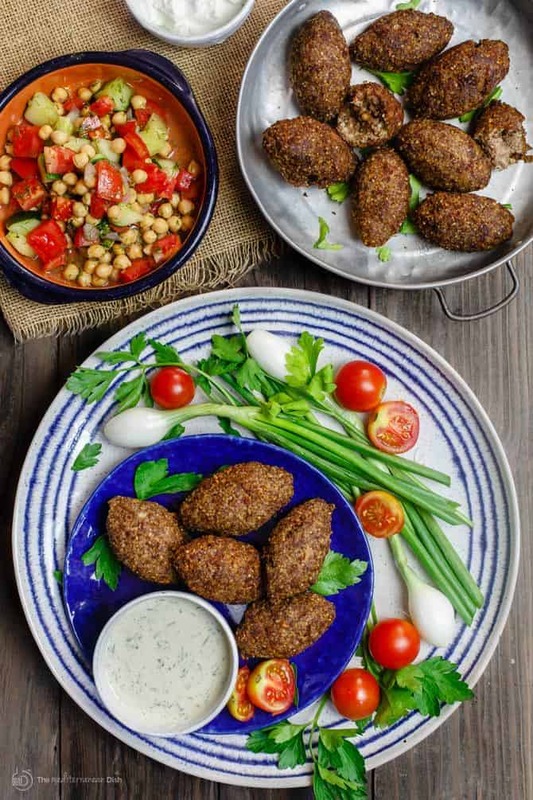 The kibbeh croquettes can be deep fried or baked, and are often served as mezze or side dish. See more on kibbeh and the step-by-step tutorial below! 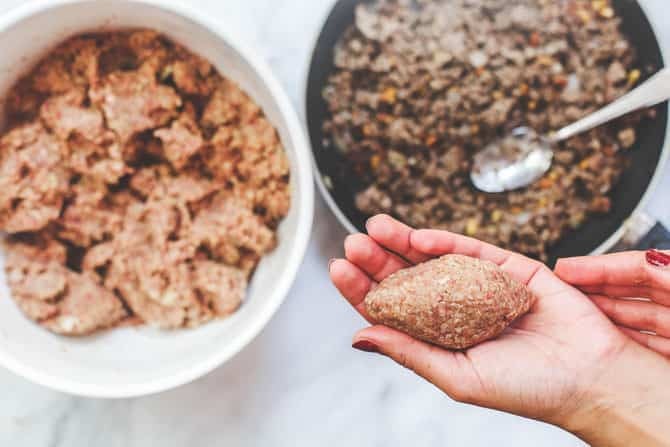 Stuffing kibbeh is a recreational activity that Middle Eastern women take as seriously as they do stuffing zucchini or rolling parcels of rice-filled cabbage leaves. It’s kind of a big deal. A right of passage, if you will. If you grew in that part of the world, it’s assumed that your mother and the ladies of your community would have trained you to make kibbeh by the time you turned 15! That was not the case for me. My closest encounter with kibbeh took place only a few years ago in my mother in-law’s Michigan kitchen. She made kibbeh in large batches on the regular. Some for the family, and a lot more for their then family-owned restaurant. I watched her form the kibbeh so precisely into small ovals, more like mini-footballs. She made it look so easy! I’ve heard kibbeh described as Middle Eastern meatballs–sort of. 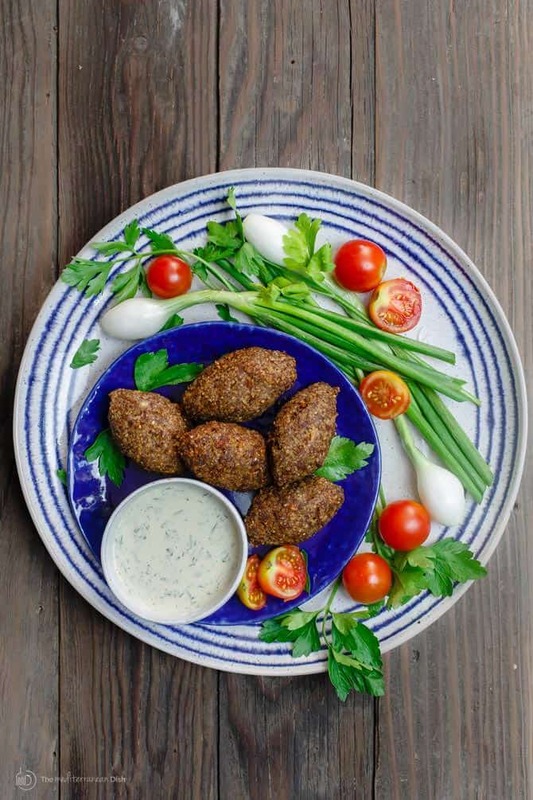 The word kibbeh stems from an Arabic verb meaning, “to form into a ball;” so that description is not entirely wrong. But as you’ll see in today’s kibbeh recipe, they’re more like stuffed croquettes. 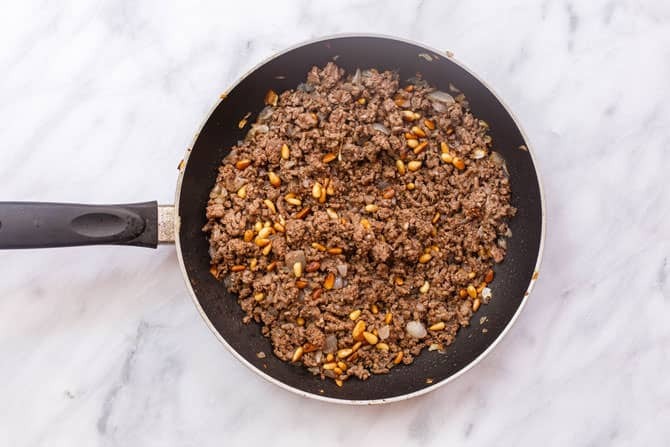 There is a crispy outer shell made with bulgur wheat, onions, and finely ground beef. The shell is then stuffed with a mixture of spiced beef and toasted pine nuts; sealed and then fried or baked. 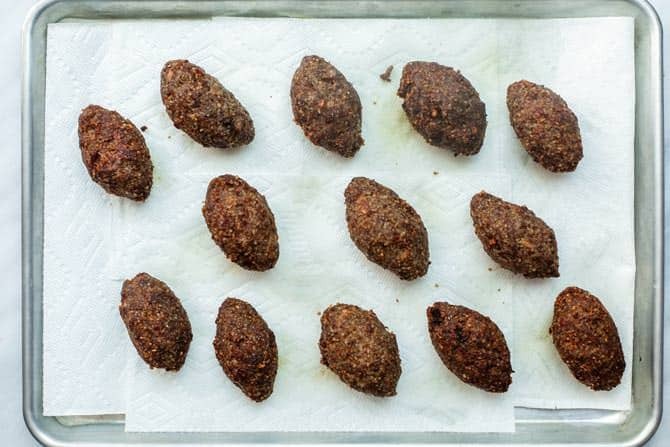 In today’s kibbeh recipe, I have attempted to follow the same football-like shape that my MIL taught me; although kibbeh can be formed into balls or even patties, whatever is easiest for you. And there are many ways to prepare kibbeh–stuffed and then fried or baked like in today’s Kibbeh recipe. The Lebanese do raw kibbeh, or kibbeh nayya, which is a delicacy that resembles steak tartar. And there is also pan kibbeh, which we will make here in the future. 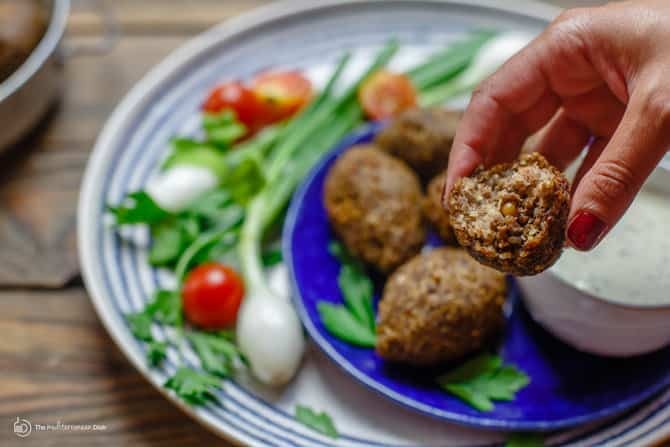 What to serve with Kibbeh? 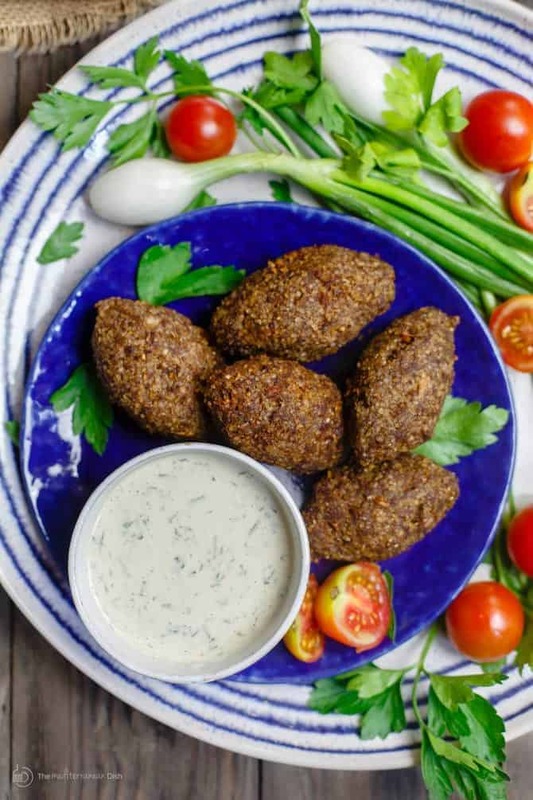 Kibbeh is best served warm with tahini sauce, tzatziki or plain yogurt. Here I served it with this Mediterranean chickpea salad; you can also serve it with tabouli, fattoush salad, or even Greek salad. 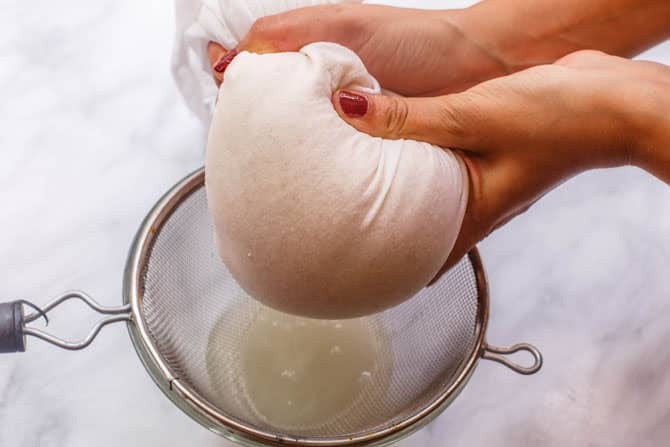 Cover a fine mesh strainer with a light cloth (a cheesecloth, if you have one). Add the bulgur wheat in, then place the strainer into a bowl filled with water. Let the fine bulgur wheat soak in the water for 15 minutes, then pull the cloth, holding the bulgur, and squeeze all the water out. You may do this a couple of times until you are sure the bulgur is rid of water. Set aside for now. Now make the kibbeh (the actual dough that you will later use to form the kibbeh shells). 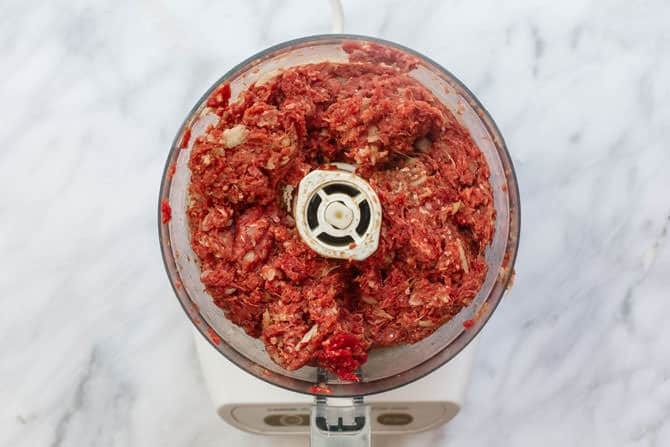 Put the onion, ground beef, spices and pinch of salt into the bowl of a large food processor. Process until the meat is very finely ground almost into a paste. Transfer the meat mixture into a large bowl and add the bulgur wheat. Use damp hands to combine the bulgur with the meat mixture to make a dough. Cover and refrigerate until later. Now make the filling. Heat about 1 tbsp olive oil in a skillet or frying pan. Saute the onion until just golden, then add the ground beef. Cook over medium heat, stirring occasionally until the meat is fully browned. Add the toasted pine nuts, the spices, and the salt and pepper. Stir to combine. Remove from the heat and set aside to cool. Remove the kibbeh dough from the fridge. To stuff the kibbeh, you need to have damp hands. Place a small bowl of water next to you. Prepare a baking sheet and line it with parchment paper. 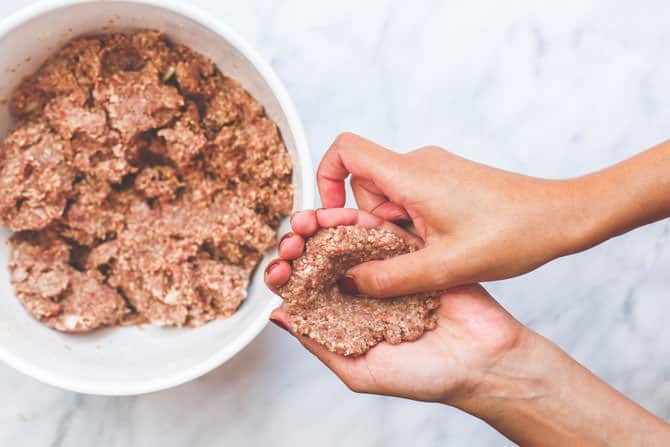 With both the bowl of kibbeh dough and the filling near, you can begin stuffing the kibbeh. Dampen your hands with some water, take a handful of the kibbeh dough (about 2 tbsp or so) and form into somewhat of an oval-shaped disc in the palm of one hand. Use your finger to make a well in the middle of the disc, and gradually hallow the disc out to make a larger well or hole for the filling. Using a spoon, add about 1 tablespoon of the filling. Seal the dough on top and, using both hands, carefully shape it into an oval (football-type shape). Place the stuffed kibbeh on the baking sheet lined with parchment paper. Repeat the stuffing steps until you run out of ingredients, be sure to have damp hands throughout. Chill the stuffed kibbeh for 1 hour, this is a very important step! 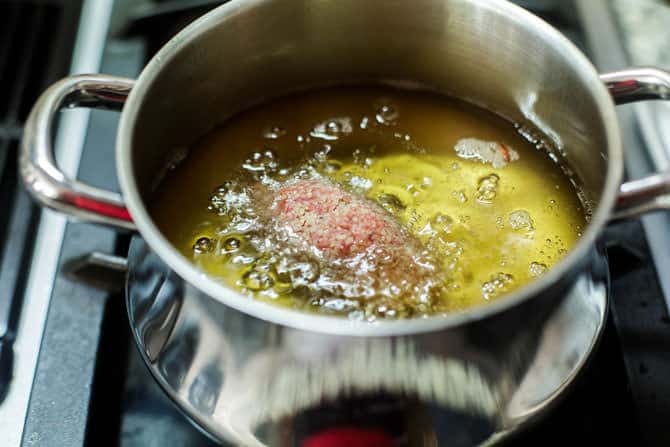 To fry, heat the oil in a deep frying pan to 350 degrees F (you’ll want the oil hot enough that you can see some gentle bubbling, but not too hot where it will burn the kibbeh shells). Deep-fry the kibbeh in the hot oil, in batches being carefully not to crowd them, until the kibbeh shells are brown (about 5 minutes or so). With a slotted spoon or tongs, carefully remove the kibbeh and place them on a pan lined with paper towel to drain. Repeat until you have fried all the stuffed kibbeh. [Alternately, you can bake the kibbeh. 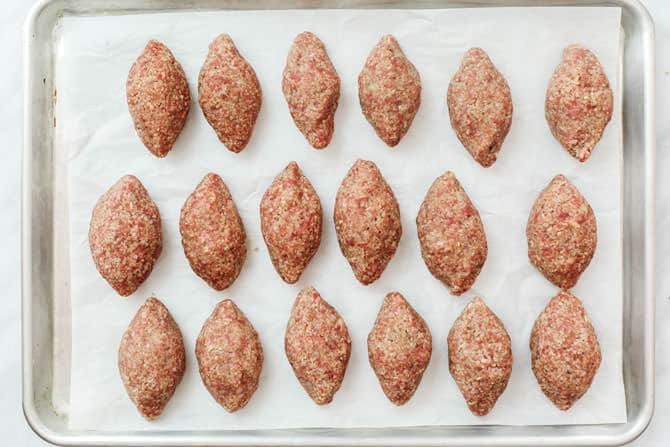 Preheat the oven to 400 degrees F. Spray the stuffed kibbeh with olive oil, and arrange them in a single layer, spaced out, on a large baking sheet. Bake until deep golden brown, likely about 30 minutes or so, but this will vary]. Serve hot or at room temperature with tahini sauce, tzatziki sauce or plain Greek yogurt. Enjoy! Now make the kibbeh (the actual dough that you will later use to form the kibbeh shells). Put the onion, ground beef, spices and pinch of salt into the bowl of a large food processor. Process until the meat is very finely ground almost into a paste. Transfer the meat mixture into a large bowl and add the bulgur wheat. 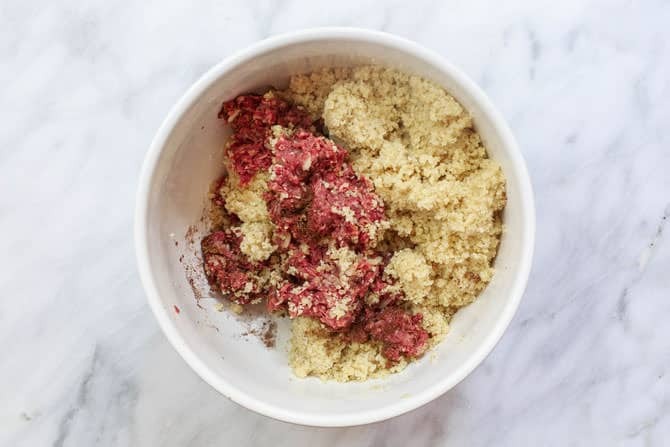 Use damp hands to combine the bulgur with the meat mixture to make a dough. Cover and refrigerate until later. Remove the kibbeh dough from the fridge. To stuff the kibbeh, you need to have damp hands. Place a small bowl of water next to you. Prepare a baking sheet and line it with parchment paper. 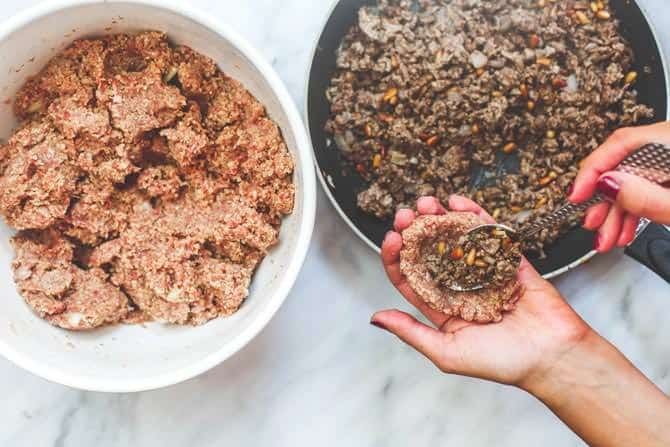 With both the bowl of kibbeh dough and the filling near, you can begin stuffing the kibbeh. Dampen your hands with some water, take a handful of the kibbeh dough (about 2 tbsp or so) and form into somewhat of an oval-shaped disc in the palm of one hand. Use your finger to make a well in the middle of the disc, and gradually hallow the disc out to make a larger well or hole for the filling. Using a spoon, add about 1 tablespoon of the filling. Seal the dough on top and, using both hands, carefully shape it into an oval (football-type shape). Place the stuffed kibbeh on the baking sheet lined with parchment paper. Repeat the stuffing steps until you run out, be sure to have damp hands throughout. Chill the stuffed kibbeh for 1 hour. 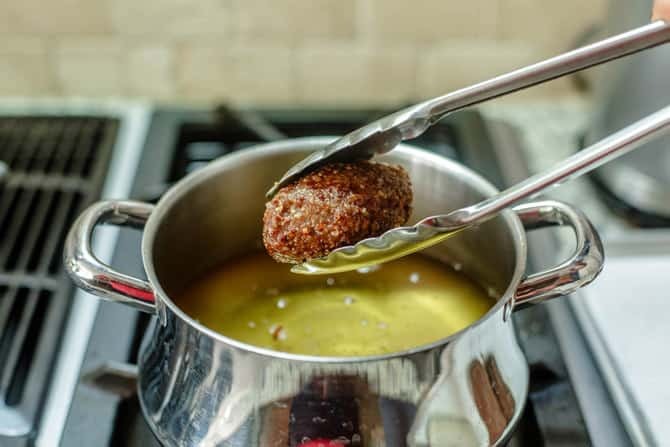 Heat the oil in a deep frying pan to 350 degrees F (you’ll want the oil hot enough that you can see some gentle bubbling, but not too hot where it will burn the kibbeh shells). Deep-fry the kibbeh in the hot oil, in batches being carefully not to crowd them, until the kibbeh shells are brown (about 5 minutes or so). With a slotted spoon or tongs, carefully remove the kibbeh and place them on a pan lined with paper towel to drain. Repeat until you have fried all the stuffed kibbeh. Serve hot or at room temprature with tahini sauce, tzatziki sauce or plain Greek yogurt. Enjoy! It is important that the kibbeh dough remains cool as you work with it. So if you think it will take you longer to finish the stuffing process (steps 5&6), place the bowl of kibbeh dough in a larger bowl filled with ice. 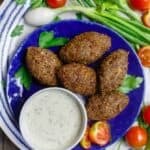 If you prefer to bake the kibbeh croquettes–Preheat the oven to 400 degrees F. Spray the stuffed kibbeh with olive oil, and arrange them in a single layer, spaced out, on a large baking sheet. Bake until deep golden brown (likely about 30 minutes or so, but this will vary). To freeze the kibbeh– You can easily freeze the kibbeh after stuffing. Instead of simply chilling for an hour (step #7), you can arrange the kibbeh on a baking sheet and freeze for an hour or two. 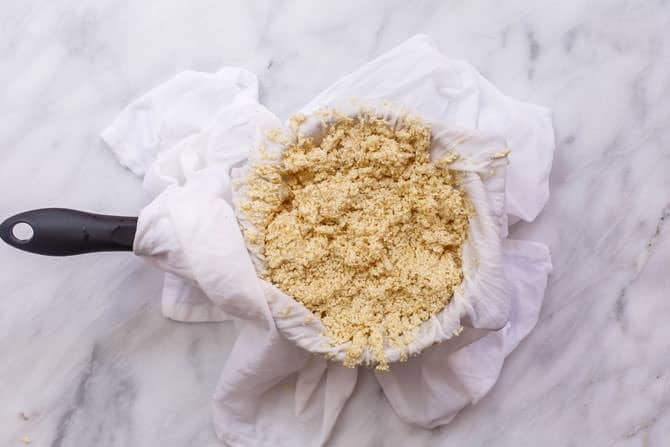 Take the baking sheet out of the freezer, once the kibbeh have hardened, and transfer the kibbeh to a freezer-safe container or even large zip lock bags. Freeze until you are ready to use. You can cook these from frozen, do not thaw. Great addition to my recipes. Loved it. Awesome, John! thank you for sharing!